After announcing the Moto G4 family, Motorola Mobility and Lenovo are now getting ready to introduce a couple of more advanced smartphones that should be called Moto Z Style and Moto Z Play. Both these handsets will likely be officially unveiled on June 9. Later this year, Verizon Wireless is expected to introduce two new Moto-made devices, too, possibly called Moto Z Play Droid Edition and Moto Z Style Droid Edition. It appears that Verizon's upcoming Droids will be just rebranded Moto Z handsets - or at least that's what a new leaked image is leading us to believe. Revealed by Evan Blass (whom you may know as @evleaks), this image - embedded below - shows an upcoming Droid smartphone in three color versions: black, silver, and gold. The device is only seen from the back, but it definitely resembles a previously leaked Moto Z handset, with the sole visible difference that there's a Droid logo etched below its rear camera, instead of a Moto logo. At the moment, it's not clear if this is the Moto Z Style / Z Style Droid Edition, or the Moto Z Play / Z Play Droid Edition. Interestingly, Evan Blass also revealed a photo showing what he's calling MotoMods. 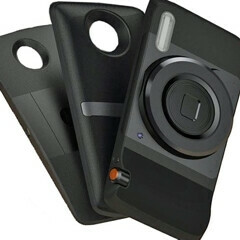 These are replaceable back covers that should add various features to the new Moto / Droid handsets. We're not really sure what two of these MotoMods are for, but the one seen on the right (check out the second image included below) is obviously a camera module - a bulky one that will seemingly make the handset for which it's built resemble a standalone camera (or, why not, the legendary Nokia Lumia 1020). As previously reported, this camera module should feature optical zoom - which kind of justifies its bulkiness. We assume that these MotoMods will be offered at extra cost (in addition to the actual prices of the upcoming Moto Z / Droid phones), much like LG's G5 modules. We're kind of intrigued by what Motorola and Lenovo are cooking up, but it remains to be seen if these modules can add functionality without compromising ergonomics. Yuck, these designs are hideous. How can they go from the sleek, ergonomically designed Moto X Pure Edition to this monstrosity? RIP Moto X Pure. Last and probably only great mainstream Motorola phone. It's good in every aspect, but leaves something to be desired at the same time in those departments. Yes it was. I still use it and it's great. It's the perfect mid range phone. You be trippen. Very ugly and worst design by Motorola. I suspect many of their employees left the company. I know their former head did and joined (or might I say "rejoined") Google. Honestly the design is not that bad to be critisized. It is kinda unique but we need to have a look at the front tho..
i really love the black one. I can take that bulk camera as long as the photos would be great. Am I the only one who likes these phones? They're different. Hopefully the front doesn't have that huge bezel on the bottom as shown in the other leaks, but i like the back. Always wanted a Moto just to be different from others. Unfortunately, Moto compromises certain features which other manufacturers excel at (for instance, the camera). Maybe the X Play is better than X Style in camera. I don't know how to describe the flaws on the X cameras. Maybe there aren't major flaws. Fingers crossed the Moto Z cameras wot be a downgrade from the X cameras. My God, these phones are just f*** dope.. When you see the actual commercial pictures you'll be blown away, especially by the Z style. Not just that but at least something looking very different from those conventional looking phones like the moto X, Z5, GS7, HTC 10, iphones, and all. The 6 grips are completely sick too. As for the mods, the first one is the premium pro camera mod, it totally changes your phone to a mind blowing DSLR camera quality phone (in look and operation with real flash and optical zoom). The second mod looks to be the kick stand power Mod for enhanced killer battery life, and as you can see, these sit flush with the camera bump. Crazy stuff.. I just hope its done right though, as this will probably be the phone of the year. I dont like Samsung but the S7 is probably the most unique flagship on the market.. dont spread lies..
Yeah, that's true. Plus these will be crap even compared to their real life pictures and the promotional pictures. Was initially skeptical too, but their geeky looks and modules have me all pumped up for the release. Previous Motorola models are looking very much better than these models. Certain Motorola trolls that are not to be named have already passed judgement on this and any possible phone released in the future. It's only a question of how long they will remain so butthurt that they blindly rush to every Motorola article to post a negative first comment. I hope the speaker is not on the back of the device. The speaker would presumably be the one on the top on the front. These designs remind me of the old Moto ROKR E8. I've always wished for a RAZR or ROKR-esque Android phone. I suspect Moto Z will be more expensive than Motorola has ever priced these recent years... Hopefully that's not true. One more thing to worry is the integration of Lenovo's UI into Stock Android. Hopefully all Moto features from the previous gens will still be here. Official renders are looking a lot slicker than the previous leaks! I'll see when the real device is revealed, but I'm not a fan of the gold-ish trim. That's not at all classy.